On Thursday, May 2, 2019, Local 13 will hold a Stop Work Membership Meeting. Local 63 will hold a Regular Membership Meeting. If you haven’t already provided an updated e-mail address to the Local 63 Business Office through the Local 63 online data input form, we ask that you come to the Business Office and provide your e-mail address in person. About 300 members have not yet updated their email address with the Office. It’s very important for Local 63 to have your current email address so that you will not miss important documents and communications from the Business Office. Attention Members: the Local 63 April 2019 Bulletin is now on the Local 63 website. Please find it under the Resources section. In the near future, it will be emailed to all members who have an email address with the Local 63 Business office. For your convenience, you may also click the below link to access the Bulletin. Click on link to read PMA memo proving information on the new Casual Longshore Dispatch Hall scheduled to open on March 1, 2019. Please feel free to share with family, friends, etc. who may find this information helpful. 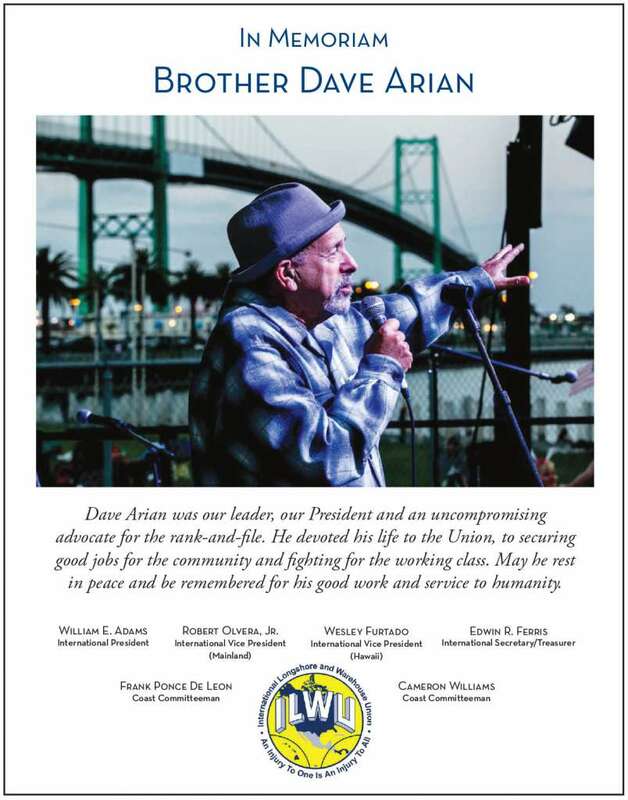 See our joint ILWU full page In Memoriam ad for recently deceased former International President Dave Arian. Brother Arian was a true Labor leader. 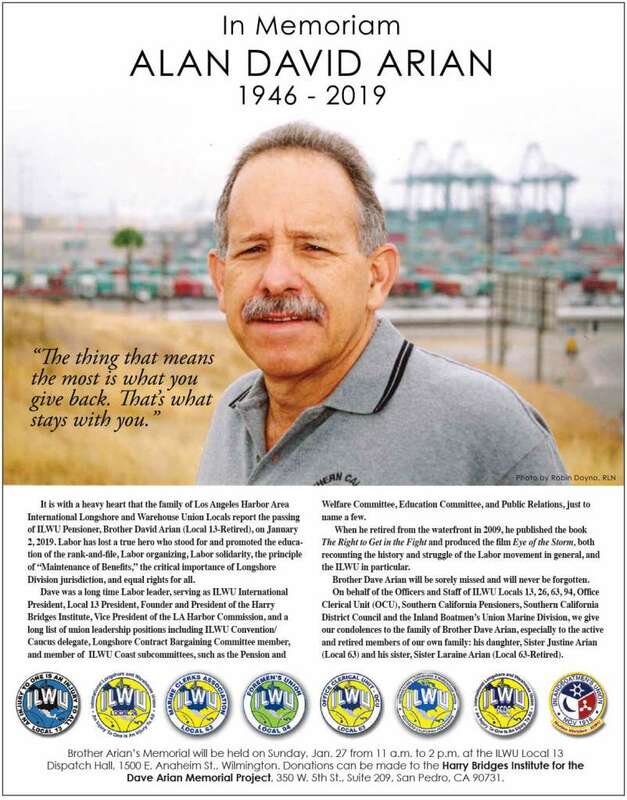 The ILWU International In Memoriam ad is also attached. Memorial service details are noted at the bottom of the ad. or visit www.HarryBridges.com to donate online. Please click to read press release from the ILWU International concerning the passing of former International President Dave Arian. Please also note that Memorial services will be held on Sunday, January 27 at 11 a.m. at the following location.